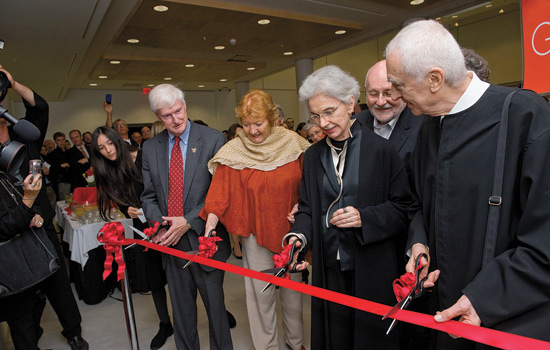 President Bill Destler, left, cuts the ribbon to the Vignelli Center for Design Studies with Lady Helen Hamlyn and Lella and Massimo Vignelli. The couple’s granddaughter, Lina Vignelli, far left, and Vignelli Distinguished Professor R. Roger Remington watch. One of the most challenging aspects of my job these days is deciding where to initiate campus tours for visitors. Do I start in the middle, showing off the Campus Center, the new hub of student activity? Or should we head south and observe the bustling activity on the new bike path and freshly landscaped pedestrian walkways? I can also point to the future of Institute Hall, a new facility to support research, biomedical engineering and chemical engineering. A new facility for the Golisano Institute for Sustainability is also in the design phase. Let’s head west. We’ve recently opened another jewel—Global Village. Global Village provides a unique environment for RIT students as they prepare to enter the global community, travel overseas and join a culturally diverse workforce. We now have in place a full set of educational and administrative assets to support innovation and entrepreneurship on campus. This includes the Center for Student Innovation, an associated design and prototyping facility, an Entrepreneur’s Hall, our business development laboratory, our intellectual property management office, and our business incubator. We are building a reputation for RIT as the place to come if you have innovative and creative ideas with the potential to yield new products, services and businesses. We are becoming a powerful economic engine regionally, nationally and globally. But it is more than brick and mortar (for those counting, we are up to 15.2 million bricks). We are changing and enhancing the student experience. And we are creating an innovation ecosystem. It’s about the people: students, faculty, staff, alumni, parents and partners. As you can see, I am very bullish on RIT’s future. Please review some annual metrics on pages 26 to 29 for further evidence. Consider this your open invitation to visit the campus any time and reconnect with faculty members, mentors and friends. Be prepared for a busy and stimulating visit. P.S. More terrific news. We just announced a campaign for a new ice arena. Go to www.rit.edu/powerplay for details.